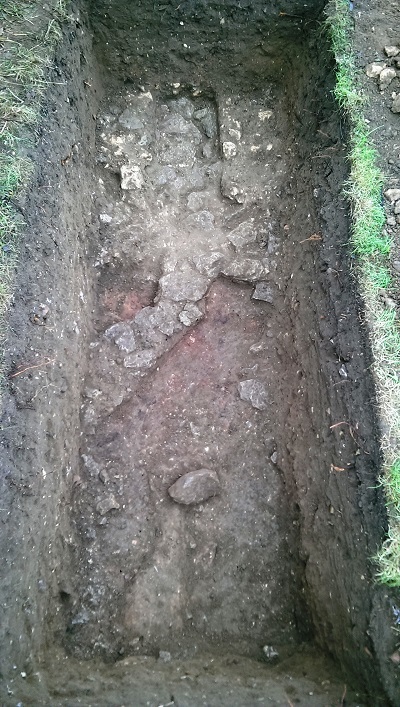 We are back digging the Romano-British villa site between Itter Crescent and Fane Road in Peterborough! 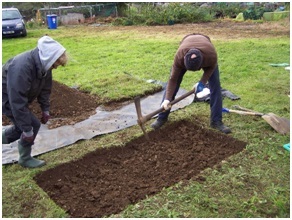 This year we have just a few days to excavate more test pits on the Fane Road allotments. The full report will be published once the finds processing and analysis is complete. Six primary test pits have been identified, however, the number that will initially be opened will be dependent on consent of allotment holders and the number of participants expected on Saturday. Test pits will be 2m x 1m in the first instance. Today was scheduled to start at midday and activity was completed by mid-afternoon. At the start of the session the weather was overcast with sunny intervals and quite windy, the ground conditions were damp and the forecast temperature was 13°C. The sole purpose of this afternoon’s activity was to prepare the site for the next three days. 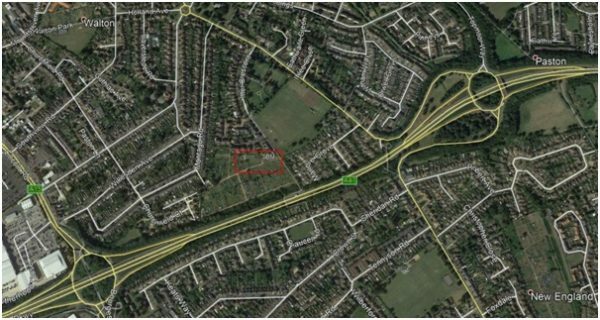 Three 2mx 1m test pits were marked out (as indicated in red on the image below) immediately south of the 2014 ‘open area’ excavation. These pits were numbered (from west to east) 17-1, 17-2, 17-3 respectively and were de-turfed ready for tomorrow’s enthusiastic volunteers. A fourth test pit (17-4) was marked out and did not require any further preparation. At the start of the morning session the weather was sunny with clear skies and breezy, becoming overcast and windy as the morning progressed, the ground conditions were slightly damp at the surface with a dry sub-soil and the forecast temperature was 13°C. As a result of the pre-start strategy discussion, a fifth test pit (17-5) was marked-out and de-turfed approximately 2m east of test pit 17-4. 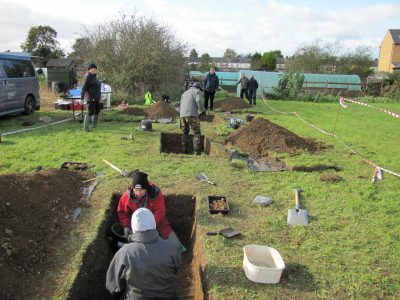 The morning saw ten volunteers from both FRAG and Fane Road Allotment Association (FRAA) on site, along with five children from the Fenland Young Archaeologists’ Club (YAC). Test pits 17-1, 17-2, 17-3 and 17-5 were opened (with YAC working in the first two pits). 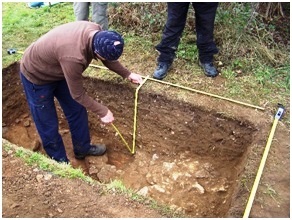 Pits were excavated in layers of 10cm depth, with each layer being designated a context within each pit; 0-10cm being context 1, 10-20cm being context 2, and so on. 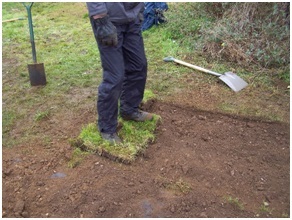 At depths varying between 8-12cm, the sub-soil became very compacted and challenging to mattock, although when cleaned back by trowel the loosened surface was quite friable. 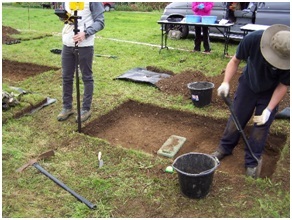 Typical finds from all pits were Roman CBM (ceramic building material) (CBM) along with detritus from modern allotment activity over the years. At the start of the afternoon session the weather was cloudy and windy with strong gusts, the ground condition of the sub-soil was dry and the forecast temperature was 15°C. The afternoon saw ten volunteers on site, along with five (different) children from YAC. Excavation continued in the same manner as started in the morning. We were also joined by two metal detectorists who scanned the spoil heaps. 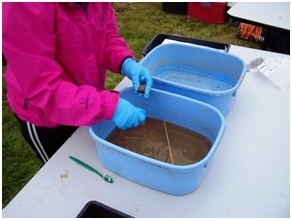 The only items overlooked by the excavators were modern waste from allotment activity (nails, wires, etc). 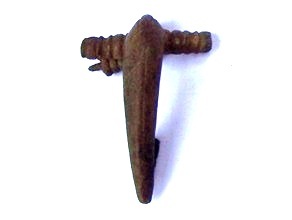 They also surveyed potential areas of archaeological interest and in doing so unearthed the find of the day – a first century AD Roman brooch. At the start of the morning session the weather was overcast and very windy, the ground conditions were dry and the forecast temperature was 10°C. There were up to seven volunteers on site during the morning which meant excavation was slower than yesterday. 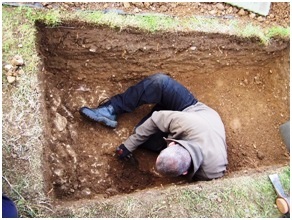 In order to excavate depth at a reasonable speed it was decided that each test pit would finish of the context currently being excavated and then ‘section’ the subsequent context(s). Test pits 17-1, 17-2 and 17-3 each half-sectioned on the west side whilst test pit 17-5 was sectioned 1m wide on the central north-south axis. 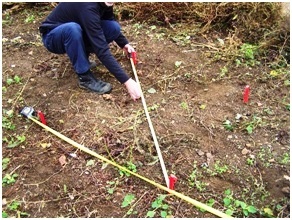 A topographical survey was also undertaken in order to provide GPS coordinates of each test pit and the Site Bench Mark. Roman period CBM continued to dominate the finds assemblage and included painted wall plaster from pit 17-1. A good number of fine and coarse ware pottery sherds were also included. At the start of the afternoon session the weather had improved with sunny intervals although the wind was still gusting strongly, the ground conditions remained dry and the forecast temperature was 10°C. 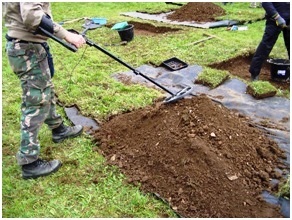 The sectioning strategy proved to be successful as each test pit was able to excavate a minimum of two contexts (20cm) taking each pit to depths of 50-60cm. In test pit 17-1 the upper surface of intact walls were exposed, in test pit concentrated compacted building demolition rubble was exposed, whilst in test pits 17-3 and 17-5 the sparse scatter of building rubble continued. The sections in test pits 17-1 and 17-2 were both extended eastwards: in 17-1, to determine the extent of wall and nature of associated spaces; in 17-2 it was to determine the extent of the demolition rubble and whether there would be a defined edge or the rubble would dissipate in a reducing spread. It was decided that test pits 17-3 and 17-5 were both inconclusive and were unlikely to produce any diagnostic or analytical archaeology, and both were recorded and closed. Test pit 17-1 continued surprise with an expanding wall structure and evidence of extreme heat on ground surfaces adjacent to the angled wall. 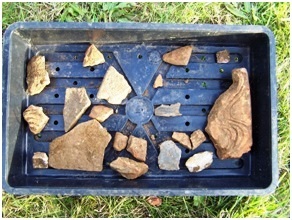 Several fine ware pottery sherds were also found in association with the wall. Test pit 17-2 revealed the building demolition rubble dissipating in a thinning eastward spread and, as it was unlikely that any further meaningful archaeology could be achieved in the time remaining it was decided to also record and close. As with the morning session, Roman period CBM continued to dominate the finds assemblage although a good number of fine and coarse ware pottery sherds were also included. 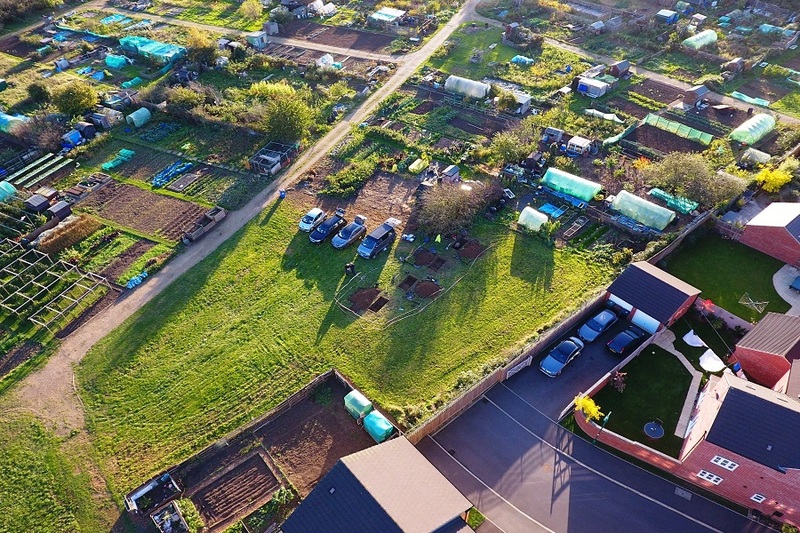 A drone was used to gain aerial shots of the site and each pit. At the start of the morning session the weather was broken cloud with light drizzle, the ground conditions were slightly damp and the forecast temperature was 11°C. With only one test pit (17-1) remaining open five volunteers was more than sufficient to make good progress. The remaining section of contexts 4 and 5 were excavated, levelling the test pit surface on context 6 at an approximate depth of 0.6m. 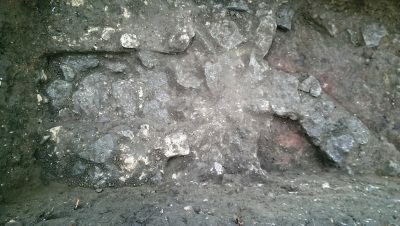 This revealed a band of stone at the edge of the south test pit wall but it was not possible to determine whether this was in situ wall or collapse. 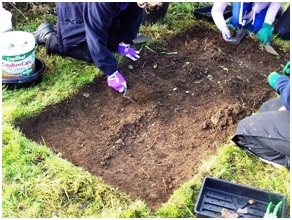 Whilst excavation was undertaken in test pit 17-1, test pits 17-2, 17-3 and 17-5 were re-turfed. The test pit surface was trowelled back ready to record when the option of extending the pit 0.5m to the west, in order to determine extend and nature of wall, was discussed and agreed. Finds again were predominantly CBM with some fine ware pot sherds and one large nail. At the start of the afternoon session the weather was overcast, the ground conditions were dry and the forecast temperature was 14°C. There were five volunteers on site at the start of the afternoon session which enabled the extension of the test pit and excavation down to context 6 to be completed quite rapidly. The extended test pit surface was cleaned up with no west edge of the wall being identified. 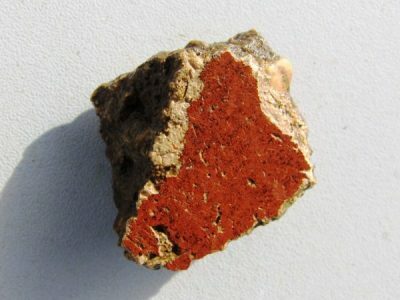 A 0.25m sondage was excavated through the upper surface of the wall which revealed this surface to be a layer of thick mortar clumps underneath which, when removed, was the upper surface of a layer of a stone wall indicative 1st Century AD Roman construction. A review of the 2014 excavation drawings and associated photographs, and the relative position of the test pit, provided a potential correlation between the wall in the test pit and a north-south wall foundation identified during the 2014 excavation. Finds continued to be CBM in the main with a small number of fine ware pot sherds continuing to appear in the assemblage. 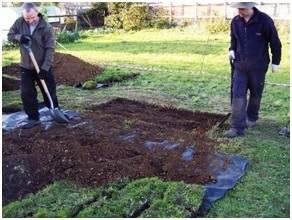 As, at this point, there was insufficient time to undertake any further productive archaeology the test pit was recorded, the surface lined, back-filled and re-turfed. 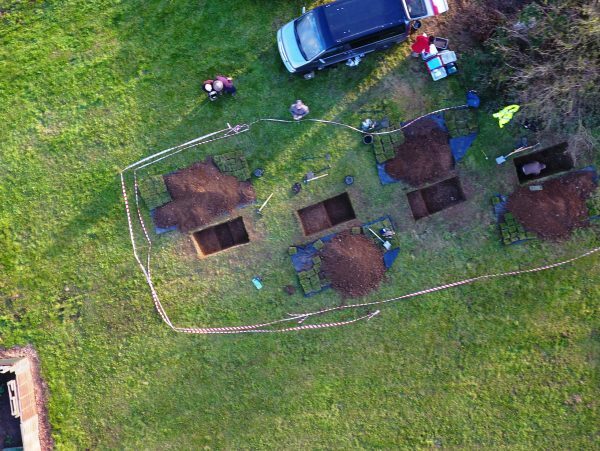 The purpose of this excavation was to revisit test pits from previous seasons that produced results requiring further investigation. 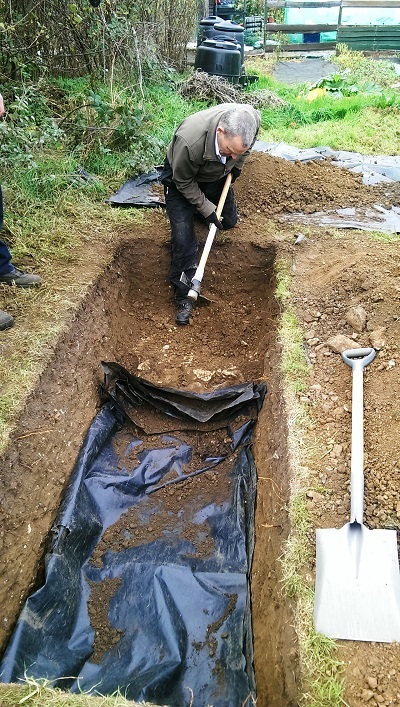 Its aim was to both identify Roman building foundations lying outside the bounds of the 2014 Heritage Lottery funded ‘Romans of Fane Road’ excavation and determine any relationships. This was clearly achieved in test pit 17-1 and, having reviewed the 2014 excavation drawings and associated photographs, there is a strong possibility that this evidence was within the footprint of test pit 17-2 at a lower depth than excavated. This proved to be a challenging but rewarding excavation that furthered the experience of FRAG members both experienced and novice. It is planned to revisit test pits 17-1 and 17-2 in Spring 2018. 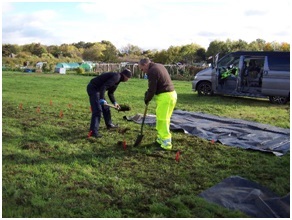 Provisionally, this will entail a 5m x 5m evaluation trench, to encompass test pit 17-1, in order to explore the extent of the wall structures and determine their relationship with the known Roman Villa. There would also be merit in excavating 17-2 to a further depth to test the potential similarities of stratigraphy identified in the previous Community Dig. No Replies to "Romans of Fane Road - 2017 Dig Diary"